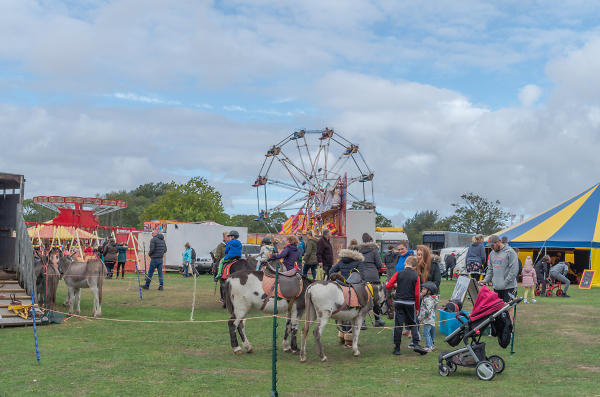 For those not familiar with the word Fayre it is used to talk about a traditional public event where goods are bought and sold and where there is entertainment and other amusements so plenty of scope for photography. Good Luck. Thanks to All who took part in this competition. Not easy to judge so Well Done the podium places. My brief comments are only an opinion and please bear in mind I have an ongoing eye problem. Night time on Goosefair by Perspicador. Although there is plenty of coloured lights in the image there is too much detail lost in the shadows. A scene from Halston Festival September 2018 by newbiek50user. I like this as it shows a well spread out image including what I'd want to see at a fayre. Owl overhead by vic cross. Not an easy image to capture, a bird in flight, so a good effort. The sort of stall seen at the fayre and probably lots of markets etc. Under the tent by Noelcmn. Where would we be without a refreshment tent? This image jumps off the page and was a strong contender. Brooklyn Flea Market by KingKenny. Perhaps if this had focussed on more of the stalls? The included shoppers helped. Dancing from on high by drofmit. Street entertainers, something seen at most fairs etc. Perhaps more separation of the stilt walkers? Think I might have cropped the left hand side off to show more of the action on the right? A colourful image of one of those mighty machines and also includes a more gentle piece of equipment in the background. Temptation indeed, those pies look delicious and the sort of item for sale at all sorts of events. Thanks Stan for a good competition and congrats to the winner and podia places. but served to do what you suggest... separate the stilt walkers... and also, not to lead the eye out of the frame. Unfortunately, because of the crowds on my side of the road, I couldn't get squarer to the action.... but the way they were dancing, I think that would have obscured the ladies! You nearly had the mobile iPod to judge.... one of the bands has a lot of elderly members, so instead of marching... they travel, seated, on a highly decorated float... drawn by a vintage tractor.... on this occasion, a little grey Fergie with red wheels. But I preferred the stilt-walking shepherds! Thanks for the second spot Stan and well done newbiek50user for your win and also well done to the joiint 3rds. Until I gave it quite a bit of thought I believed my only valid entries were very ancient and wasn't certain they were Pentax related even though they probably were (no exif on 35mm film!) Anyhow found something to enter. Congrats newbiek50user, fine shot, feel good family image, complete with perambulator and the big wheel! And extended to JAK, Retsoor and Larsenic. Thanks Stan for the challenge, the judging and C&C's. as always, much appreciated. Thank you Stan for your decision. This is the first time that I have ever won any photography competition and because of the high standard of entries for the User Groups competitions I never really expected to win. I have just seen the competitions as a weekly challenge to develop new skills. I have to apologise for not setting this weeks challenge earlier. As I say, my win was a surprise so I have only looked at the site this morning to see which photo won. My next worry was how to set a competition on the site and how I will go about judging. Thanks to Tyronet for a good competition and for my 3rd place. Congratulations to newbiek50user for 1st place with a worthy picture and to JAK and Larsenic.